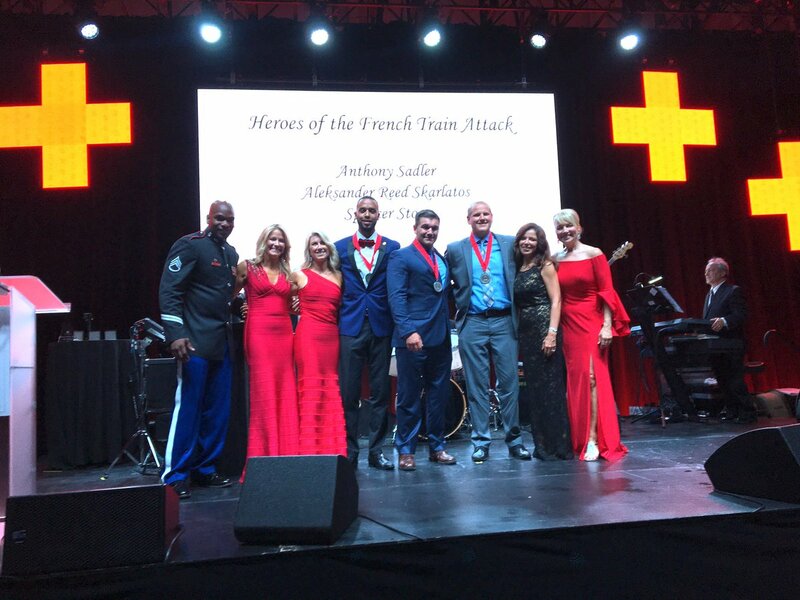 Honoring the Paris Train Attack Heroes at the Red and White Ball. Over the last 7 days, the Greater New York Red Cross provided emergency assistance to 84 adults and 41 children following 49 local disasters. Here are some highlights from last week and a preview of upcoming activities (see below). On Saturday the Metro New York North Red Cross held its annual Red and White Ball emceed by Voice contestant and Army Staff Sergeant Jeremy Gaynor (who also performed). Highlights of the night included recognizing J.R. Martinez and the Paris Train Heroes for their inspirational stories. On Sunday, the Staten Island Disaster Action Team was out in the community supporting the March of Dimes walk. On Friday, we held a special live-streamed panel with the Paris Train Heroes to discuss their harrowing experience in late 2015. Watch the full live-stream here. Thanks to Viacom for choosing to volunteer with us on their Community Day by installing smoke alarms in West Harlem alongside our #GetAlarmedNYC team. To promote Red Cross Giving Day, our volunteers stood out in the rain on the Today Show Plaza during the morning broadcast to help spread the word and cheer on the Red Cross. A few days after the tragic fire in Queens Village, Red Cross volunteers were still comforting family members and installing free smoke alarms in the area. On Tuesday, Red Cross and FEMA took part in a drill together as part of a warm-up to our annual full-scale exercise in June. The Long Island Red Cross provided canteen support for mourners at the wake of fallen FDNY Firefighter William Tolley in Bethpage, N.Y. Thank you to PSEG Long Island for helping us to make more than 40 families in Stonybrook safer by installing free smoke alarms. We started off the week teaching disaster preparedness to 800+ kids at P.S. 105 via our Pillowcase Project program. NY1’s Roger Clark filed this amazing report. May 2, 4, 5, 8: Red Cross blood drive: 2 to 7pm: 520 West 49th Street, Manhattan. Schedule an appointment to donate today. May 6: Want to become a part of the Red Cross Movement and help change the world one community at a time? Register to attend our volunteer orientation in Manhattan or in Goshen and learn about the many ways you can impact your community and make new friends by volunteering with the American Red Cross. Aug 22-27: Do you like to volunteer? Do you like golf? If so, have we got an opportunity for you! Sign up today to volunteer at THE NORTHERN TRUST at Glen Oaks Club in Old Westbury, NY 8/22-8/27. For $75 you gain daily access to the tournament for you and a guest, a logoed polo shirt & baseball cap, and much more. Plus, your efforts will support the mission of the American Red Cross. Learn more here.